Make the most of the fun, festivities and wealth of business opportunity the month of December provides, by preparing for these weird holidays in December. Dig out and dust down your favorite tie from the wardrobe and encourage employees to smarten up with a swanky tie for December’s National Tie Month. This wacky month-long holiday could be promoted by clothing retailers as the perfect way to sell ties in the forthcoming weeks. If you’ve not yet written a business plan, now’s the time to do so, in National Write a Business Plan Month. Writing a business plan in December can be a pivotal step in assisting your business with growth and profitability in the new year. Another month-long holiday in December is the strangely-named Operation Santa Paws, devoted to helping abandoned and abused animals. If you run an animal refuge center or are in the veteran or pet grooming business, you could use this animal-friendly holiday as a means of promoting your business. If you’re in the pawnbroker business, December 6th is the time to put your business on the pedestal of recognition it deserves and promote your services wide and far on National Pawnbrokers Day. Use the hashtag #NationalPawnbrokersDay to prepare and promote your business ahead of this slightly bizarre December holiday. Though pawnbrokers we warned, you share your national day with miners, as December the 6th is also dedicated to Miners Day. National Miner’s Day marks the anniversary of the worse accident in the U.S.’s mining history, giving those in the mining trade the opportunity to promote their imperative services. Fast-forward to December 15, and it’s National Ugly Christmas Sweater Day. 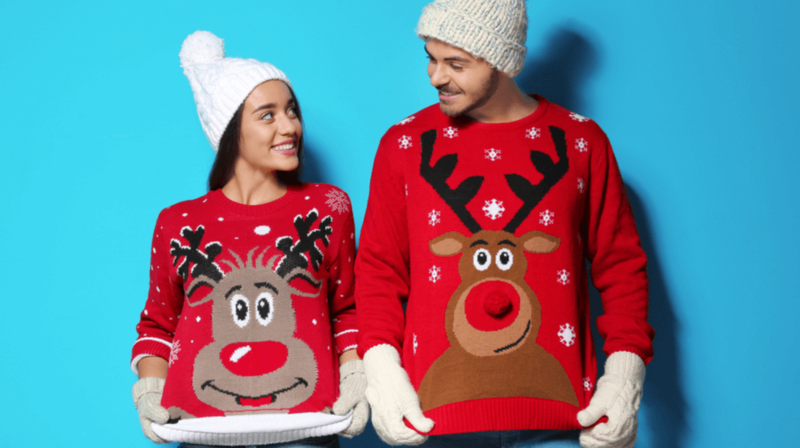 Staff of any business can have fun and boost morale by seeing who can wear the ugliest sweater. Fashion retailers can really go to town, displaying perhaps a ‘not-so-ugly’ sweater line! Make sure your customers are aware you are involved in the National Free Shipping Day, held annually in mid-December. Generate additional orders by offering free shipping to your customers so you don’t fall behind to competitors. Boxing Day is also shared with National Thank You Note Day, providing business of all sizes and sectors the opportunity to show their appreciation to customers, clients and employees by writing them a personalized thank you note. If you run a stationery or card-based business then use this national holiday to promote your pens, envelopes, stamps and cards by encouraging people to write a note of appreciation on National Thank You Note Day. What is officially the last working day of the year – December 28 – is devoted to No Interruptions Day. Now’s the time to get organized for the new year by tidying your workspace, without interruptions – easier said than done! Tick Tock Day reminds us that there are only two days remaining in the year and, if you’ve got any unfinished business to take care of, now’s the time to do it. Use this weird December holiday to encourage employees to have unfinished tasks completed so they can start a clean slate in the new year. Another December holiday that causes the mind to boggle is National Bicarbonate of Soda Day. If your business makes or sells this multi-purpose household item, National Bicarbonate of Soda Day is the time to promote your product to the maximum to customers. It’s the last day of the year and the time to stop being indecisive, follow through with ideas and decisions and stop thinking about quitting, on Make Up Your Mind Day. Promoting a culture of determination and resolution on Make Up Your Mind Day can be a great way to help start your business with a bang in the new year.